The University of Florida was established in Gainesville in 1906 and fielded its first official varsity football team that fall. In over 110 years of football, the Gators have played in over forty bowl games; won three national championships (1996, 2006 and 2008) and eight Southeastern Conference championships (1991, 1993, 1994, 1995, 1996, 2000, 2006 and 2008) and have produced three Heisman Trophy winners, more than ninety first-team All-Americans and fifty National Football League (NFL) first-round draft choices. Since 1906, Florida football has had twenty-six head coaches, including three who were inducted into the College Football Hall of Fame for their coaching success. Its first head coach was Pee Wee Forsythe with Dan Mullen becoming the Gators' most recent head coach in 2018. Florida football competed for its first several seasons as an independent before joining the Southern Intercollegiate Athletic Association in 1912. They moved to the Southern Conference in 1922, then left with a dozen other schools to establish the new Southeastern Conference (SEC) in 1932. Florida is currently one of fourteen member institutions in the SEC, and the football team has competed in the SEC Eastern Division since the league began divisional play in 1992. Florida plays an eight-game SEC schedule, with six games against the other Eastern Division teams: Georgia, South Carolina, Tennessee, Kentucky, Missouri and Vanderbilt. The schedule is filled out with an annual game against Louisiana State and a rotating SEC Western Division team. Until 2003, the Gators also played Auburn every season, but contests in the rivalry are now infrequent events as part of the SEC's rotating opponent system. Florida has also played in-state rival Florida State every year since 1958, usually facing off in the last game of the regular season. The two teams' emergence as perennial football powers during the 1980s and 1990s helped build the Florida–Florida State rivalry into a game which often has national-title implications. Before 1988, in-state rival Miami was also an annual opponent; due to expanded conference schedules, the Florida–Miami rivalry has been renewed only three times in the regular season and twice in bowl games since then. The remaining dates on Florida's regular schedule are filled by non-conference opponents which vary from year to year. Florida's outdoor sports teams initially played most of their homes games at a municipal park near downtown Gainesville. In 1911, the university installed bleachers alongside a grassy area on the north edge of the campus and dubbed it University Athletic Field, which was expanded and renamed Fleming Field in 1915. The football program finally moved into a modern stadium in 1930, when the university built 22,000 seat Florida Field just south of Fleming Field. In 1989, the name was extended to "Florida Field at Ben Hill Griffin Stadium" to honor alumnus and sports benefactor Ben Hill Griffin. In 2016, former player and coach Steve Spurrier was honored by having his name added to the name of the field; it is now officially known as "Steve Spurrier-Florida Field at Ben Hill Griffin Stadium". The facility is also commonly known as "The Swamp", a nickname that Spurrier coined in 1992, when he was Florida's head ball coach. Florida Field has been renovated and expanded many times over the decades and has a capacity of almost 90,000. Even after Florida Field was constructed, Florida occasionally scheduled "home" game in other cities across the state, most often Tampa or Jacksonville. This practice was common in the early years of the program, when the Gators' home field was smaller and traveling to Gainesville was more difficult. The frequency of these rotating home games had decreased from one or two contests per season in the 1930s to one every few seasons by the 1980s. With the exception of the traditional rivalry game against Georgia, the Gators have not scheduled any home games outside of Gainesville since Florida Field expanded to became the largest football stadium in the state in 1990. Florida's football program is a charter member of the Southeastern Conference, which began play in 1933. Before that, the Gators were affiliated with two different conferences after having founded the program without a conference affiliation. The 1996, 2006 and 2008 Gators were ranked number one in the final AP and Coaches Polls and were recognized as consensus national champions after winning postseason national-championship games. The 1984 Gators were recognized as national champions by The Sporting News, The New York Times and the Billingsley, DeVold, Dunkel, FACT, Matthews, and Jeff Sagarin rankings. However, they finished third in the final AP Poll and seventh in the final UPI Coaches Poll behind the BYU Cougars, who were number one in both major polls and thus considered the national champions in the pre-Bowl Alliance and BCS era. The 1985 Gators finished fifth in the final 1985 AP Poll and were recognized as national champion by one minor selector. Partially because the football program was on NCAA probation in the mid-1980s, the university has never claimed a share of the national championship for either the 1984 or 1985 season. With the addition of Arkansas and South Carolina to the Southeastern Conference in 1992, the conference split into eastern and western divisions and a game between the division winners determined the SEC champion. Florida has made twelve appearances in the SEC Championship Game (the most by any SEC school), its most recent in 2016. The Gators have won seven of the twelve SEC Championship Games in which they have appeared. † In 1992, Florida finished the season tied with Georgia for the SEC East; however, Florida had defeated Georgia and won the tie-breaker to represent the division in the 1992 SEC Championship Game. In 2003 Florida ended the regular season in a three-way tie for the SEC East title with Georgia and Tennessee, and in 2012 the Gators were tied with Georgia. According to the SEC's tie-breaking procedure, Georgia was selected to represent the division in the 2003 SEC Championship Game and 2012 SEC Championship Game. Florida has appeared in 44 NCAA-sanctioned bowl games, garnering a 23–21 record. This includes a streak of 22 consecutive bowl-game appearances from 1991 through 2012, the fifth-longest in college football history. Four of their bowl games were for a National Championship, with two under the Bowl Alliance and two in the Bowl Championship Series. Florida is 3–1 in national championship games. † The 1912 Bacardi Bowl held in Havana, Cuba was not sanctioned by the NCAA and was intended to be one half of a two game event which was not completed due to a dispute over the rules of the game. As such, the University of Florida Athletic Association does not include the contest in the Gators' official bowl record. Florida's season records are from the record books of the university's athletic association. Through 2018, Florida has compiled an overall record of 718 wins, 435 losses, and 37 ties (including post-season bowl games). As of the end of the 2018 season. Historically, Georgia has been Florida's most hated and fierce rival. Previously known as "The World's Largest Outdoor Cocktail Party," and now most commonly called the "Florida–Georgia game" by Gator fans, this rivalry often decides the SEC East and has national implications. The game is held at TIAA Bank Field in Jacksonville, Florida, usually on the last Saturday in October or the first Saturday in November. The designated "home" team alternates, with ticket distribution split evenly between the schools. Georgia had early success in the rivalry, winning the first six games and holding a 21–5–1 series lead before 1950. After the 2018 game Florida has won 21 out of the most-recent 29 games, and holds a 38–30–1 advantage in the series since 1950. The Bulldogs lead the series overall, 51–43–2. Since 2009, the Okefenokee Oar has been awarded to the winner of the Florida-Georgia game. Florida last received the oar for its 2016 victory. The rivalry reached a peak during the 1990s. In 1992, the SEC expanded to twelve schools and split into two divisions. Florida and Tennessee (in the Eastern Division) have met every year since, usually in mid-September for both teams' first conference game of the season. Led by coaches Steve Spurrier and Phillip Fulmer and featuring players such as Danny Wuerffel and Peyton Manning, both teams were highly ranked and the game had conference- and national-title implications. Florida and Tennessee combined to win two national championships during the decade. Since becoming annual opponents, the Gators and Volunteers have combined to represent the Eastern Division in the SEC Championship Game fifteen times in twenty seasons. Florida had an eleven-game winning streak against Tennessee (from 2005 to 2015) and leads the series 28–20 through the 2018 season. Contrary to popular belief, Florida's state legislature did not decree that Florida and Florida State should meet on the field; a bill mandating the game was rejected by the Florida Senate. Prodding by Florida governor LeRoy Collins facilitated an agreement between the two universities to begin an annual series in 1958. Due to Florida State's smaller stadium, the first six games were played at Florida Field. The series has alternated between the campuses since 1964, when Doak Campbell Stadium in Tallahassee was expanded. Florida dominated the early series with a 16–2–1 record through 1976. Both teams have produced significant winning streaks, and the series is nearly tied over the past four decades; Florida State holds a 23–16–1 advantage. Florida leads the all-time series, 35–26–2. Louisiana State and Florida first met on the football field in 1937, and have been annual opponents since 1971. Since 1992, LSU has been Florida's permanent inter-divisional rival from the SEC Western Division. The winner of the Florida–LSU game went on to win the Bowl Championship Series (BCS) national championship game in the 2006, 2007, and 2008 seasons. This rivalry has been known recently for close games, with both teams highly ranked. Florida leads the all-time series, 33–29–3. The series has had several notable upsets. Auburn defeated previously-unbeaten Florida teams in 1993, 1994, 2001, 2006 and 2007, although the Gators won SEC championships in 1993, 1994 and 2006. Florida and Miami formerly played each other for the Seminole War Canoe Trophy, but they canceled after the 1987 season when Florida's annual SEC schedule expanded to eight games. The teams did not play each other again until the 2001 Sugar Bowl. Florida and Miami played a home-and-home series in 2002 and 2003, and met again in the 2004 Peach Bowl. 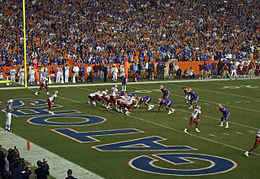 The Gators won the first leg of a home-and-home series in 2008, ending a six-game losing streak against the Hurricanes. Their 2008 victory against Miami was Florida's only victory against them in the last 30 years. The last scheduled regular-season meeting of the Gators and the Hurricanes was in Miami in 2013, where the Hurricanes won 21–16. The next scheduled matchup between the schools will open up the 2019 season on August 31 at the Camping World Kickoff in Camping World Stadium in Orlando, Florida. Twelve people associated with Florida have been inducted into the College Football Hall of Fame, four as head coaches and nine as players. Steve Spurrier was inducted into the Hall of Fame in 1986 for his record as Florida's Heisman Trophy-winning quarterback from 1964 to 1966 and again in 2017 for his head coaching achievements at Duke, Florida, and South Carolina. He is one of four members of the College Football Hall of Fame inducted as both a player and a coach. Doug Dickey, Florida's quarterback in 1951 and 1952, was inducted into the Hall of Fame in 2003 for his record as head coach of the Tennessee Volunteers from 1964 to 1969 and the Gators from 1970 to 1978. Marcelino Huerta, a standout Gator lineman from 1947 to 1949, was inducted in 2002 for his record as head coach of the Tampa Spartans, Wichita State Shockers and Parson Wildcats. Since Florida's first season in 1906, eighty-nine players have received one or more selections as first-team All-Americans. This includes thirty-two consensus All-Americans, of which six were unanimous. The first Florida first-team All-American was end Dale Van Sickel, a member of the 1928 team. Florida's first consensus All-American was quarterback Steve Spurrier, the winner of the Heisman Trophy for the 1966 Gators. The Fergie Ferguson Award is given in memory of one of the University of Florida's finest athletes, Forest K. Ferguson. Ferguson was an All-SEC end for Florida in 1941 and state boxing champion in 1942. Subsequently, a second lieutenant in the U.S. Army, he led an infantry platoon during the D-Day landings in Normandy on June 6, 1944. Ferguson helped clear the way for his troops to advance on the Axis position, and was severely wounded leading his men in the assault. A recipient of the Distinguished Service Cross for his actions, he died from war-related injuries in 1954. The award, a trophy, is given to the senior football player who most displays "leadership, character, and courage." The Gators do not currently have any retired jersey numbers. Although Steve Spurrier's (11) and Scot Brantley's (55) numbers were once retired, Spurrier reissued them as head coach. The Florida Football Ring of Honor, the Gator's alternative to retiring a player's number, pays homage to former players and coaches. The University of Florida Athletic Association created the Ring of Honor in 2006 to commemorate 100 years of Florida Football. Jerseys with numbers worn by Wilber Marshall, Emmitt Smith, Steve Spurrier, Danny Wuerffel, and Jack Youngblood are displayed on the facade of the north end zone of Steve Spurrier-Florida Field at Ben Hill Griffin Stadium; their numbers are used by current players. In July 2018, the university announced that Tim Tebow would be inducted into the Ring of Honor during a game on October 6, 2018. A Florida Football All-Time Team was compiled by the Florida Alumnus, the official publication of the Florida alumni, in 1927. The Florida Football All-Century Team, chosen by Gator fans, was compiled by The Gainesville Sun in the fall of 1999. The 100th-Anniversary Florida Team was selected in 2006 to celebrate a century of Florida football. Fans voted by mail and online. The Florida football team has worn a home uniform of blue jerseys (usually a variation of royal blue) with white pants for most of the program's history. The most notable exception was a decade-long period from 1979 until 1989, when at the suggestion of coach Charlie Pell, the Gators switched to orange home jerseys. For road games, Florida wears white jerseys with blue, orange, or white pants, depending on the colors of the opponent or the choice of the players that week. Steve Spurrier restored the home blue jerseys when he became the Gators' head ball coach in 1990. From 1990 until 2014, Florida's primary home uniforms were blue jerseys with white pants, with blue pants an option for high-profile games, especially at night. Former coach Jim McElwain usually allowed his senior players to decide which uniform combination the team wore for each game. Since this practice began during the 2015 season, the Gators have worn many different combinations of blue or orange jerseys along with blue, orange, or white pants. 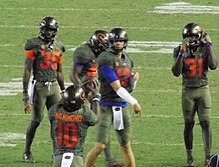 Florida has occasionally worn alternative uniforms, which are usually similar to current or former uniforms and used an orange and blue color scheme. One exception were the "swamp green" uniforms used at a home game against Texas A&M in October 2017. These used a dark green theme for the entire uniform from shoes to helmet that was inspired by the appearance of actual alligators. The uniform marked the 25th anniversary of former coach Steve Spurrier introducing the Swamp nickname for Florida Field. Florida has had a number of helmet designs, especially early in the program's history. Since the end of the leather helmet era, base colors have alternated between orange, white, and (occasionally) blue, and logos have included the “Gators” script font, an interlocking "UF", a simple "F", and the player number. From 1979 until 2006, Florida wore orange helmets with a script "Gators" logo in all contests. To commemorate the 100th year of the football program in 2006, the Gators played one game wearing throwback uniforms modeled after their mid-1960s uniforms which included white helmets with a simple "F" logo. In 2009 the Gators participated in Nike's Pro Combat uniform campaign, wearing specially-designed blue uniforms and white helmets with a slant-F logo. These uniforms were worn for the last regular-season game against Florida State, and the white helmets were worn again the following week against Alabama in the SEC Championship Game with white jerseys and pants. Florida introduced a different white alternative helmet in 2015 which featured the script "Gators" logo on one side and the slant-F logo on the other, and in 2018 replaced the slant-F with script "Gators" on both sides. In 2017, the Gators wore "swamp green" helmets for one game. These dark green helmets featured a color-altered Gator head logo on one side and the player's number in orange on the other. Both Gonzales (2005-2009) and Hevesy (2005-2008) coached with Mullen while he was the offensive coordinator at Florida under Urban Meyer from 2005-2009. Christian Robinson will serve as a coordinator for the first time in his coaching career. Robinson's career as a linebacker in college concluded in 2013 when he graduated from the University of Georgia. He went on to become a graduate assistant at Ole Miss, Georgia and MSU under Mullen. Florida has played each of the other members of the SEC Eastern Division every year since the SEC expanded to an eight game league schedule in 1992. Florida's annual conference opponents are Kentucky, Tennessee, Vanderbilt, Georgia, Missouri, and South Carolina, usually scheduled in that order. In addition to six games against eastern division opponents, Florida plays two games against western division opponents. Florida's permanent non-division opponent is Louisiana State (LSU), whom the Gators play annually. The other six SEC Western Division teams rotate on a six-year cycle, with the Florida playing every western division team once every six years (twice every twelve years) with alternating home and away games. The winners of the east and west divisions meet in the SEC Championship Game, potentially creating a rematch of a regular season contest. Florida has played in 12 SEC Championship Games and have been involved in two rematches - in 1999, when they lost to Alabama in the regular season and lost again in the SEC championship, and in 2000, when they beat Auburn during the regular season and defeated them again to win the conference title. Florida has played a continuous series against in-state rival Florida State (FSU) since 1958. While the eight game SEC slate plus the annual matchup with FSU are set years in advance, the schedule allows for two or three additional non-conference games against various opponents that are usually played in Gainesville for revenue purposes. In recent years, Florida has been also invited to participate in several season opening non-conference neutral-site games which do not count against the NCAA cap on regular season games. ^ The NCAA records for "consensus" All-Americans do not reflect the total number of All-American honors received by Gators football players, only those players who received a majority of the various first-team All-American selections at their position in any given season. The Gators' first consensus All-American was quarterback Steve Spurrier in 1966; the thirty-second and most recent was cornerback Vernon Hargreaves in 2015. ^ NCAA Football Award Winners, National Collegiate Athletic Association, Indianapolis, Indiana, pp. 7–13 (2015). ^ Marty Gitlin (1 September 2012). Florida Gators. ABDO Publishing Company. p. 14. ISBN 978-1-61480-310-2. ^ 2009 Southern Conference Football Media Guide, Year-by-Year Standings, Southern Conference, Spartanburg, South Carolina, p. 74 (2009). Retrieved August 30, 2010. ^ Boyles, Bob; Guido, Paul (1 January 2009). "The USA Today College Football Encyclopedia". Skyhorse Publishing Inc. – via Google Books. ^ College Football Data Warehouse, 1996 National Championships. Retrieved November 29, 2012. ^ a b c d "1996 Florida Gators". Archived from the original on 2016-10-03. ^ a b c d "2006 Florida Gators". Archived from the original on 2016-10-03. ^ a b c d "2008 Florida Gators". Archived from the original on 2016-10-03. ^ College Football Data Warehouse, 1984 National Championships. Retrieved November 29, 2012. ^ College Football Data Warehouse, 1985 National Championships. Retrieved November 29, 2012. ^ Dooley, Pat (20 November 2009). "Do not forget 1984, UF football's first SEC title". Gainesville Sun. Archived from the original on 8 March 2017. ^ a b c d e "Florida Gators Football Record By Year". College Football at Sports-Reference.com. ^ a b "1991 Florida Gators". Archived from the original on 2016-10-05. ^ a b c "1993 Florida Gators". Archived from the original on 2011-06-20. ^ a b c "1994 Florida Gators". Archived from the original on 2011-06-22. ^ a b c "1995 Florida Gators". Archived from the original on 2016-10-05. ^ a b c "2000 Florida Gators". Archived from the original on 2016-10-03. ^ a b "1992 Florida Gators". Archived from the original on 2016-10-03. ^ a b "1999 Florida Gators". Archived from the original on 2016-10-03. ^ a b "2003 Florida Gators". Archived from the original on 2016-10-03. ^ a b "2009 Florida Gators". Archived from the original on 2016-10-05. ^ a b "2012 Florida Gators". Archived from the original on 2016-10-05. ^ a b "2015 Florida Gators". Archived from the original on 2016-04-22. ^ "All-Time Consecutive Bowl Appearances". cfbdatawarehouse.com. ^ "1912 Florida Gators". Archived from the original on 2016-10-03. ^ "1952 Florida Gators". Archived from the original on 2016-10-05. ^ "1958 Florida Gators". Archived from the original on 2016-10-03. ^ "1960 Florida Gators". Archived from the original on 2016-10-03. ^ "1962 Florida Gators". Archived from the original on 2016-09-24. ^ "1965 Florida Gators". Archived from the original on 2016-04-04. ^ "1966 Florida Gators". Archived from the original on 2015-11-02. ^ "1969 Florida Gators". Archived from the original on 2016-10-03. ^ "1973 Florida Gators". Archived from the original on 2016-10-03. ^ "1974 Florida Gators". Archived from the original on 2016-10-03. ^ "1975 Florida Gators". Archived from the original on 2016-10-05. ^ "1976 Florida Gators". Archived from the original on 2016-10-03. ^ "1980 Florida Gators". Archived from the original on 2016-10-03. ^ "1981 Florida Gators". Archived from the original on 2016-04-06. ^ "1982 Florida Gators". Archived from the original on 2016-10-05. ^ "1983 Florida Gators". Archived from the original on 2016-10-03. ^ "1987 Florida Gators". Archived from the original on 2016-10-03. ^ "1988 Florida Gators". Archived from the original on 2016-04-02. ^ "1989 Florida Gators". Archived from the original on 2016-10-03. ^ "1997 Florida Gators". Archived from the original on 2016-10-03. ^ "1998 Florida Gators". Archived from the original on 2016-10-03. ^ "2001 Florida Gators". Archived from the original on 2016-10-03. ^ "2002 Florida Gators". Archived from the original on 2016-10-03. ^ "2004 Florida Gators". Archived from the original on 2016-10-03. ^ "2005 Florida Gators". Archived from the original on 2016-10-03. ^ "2007 Florida Gators". Archived from the original on 2016-10-03. ^ "2010 Florida Gators". Archived from the original on 2016-10-03. ^ "2011 Florida Gators". Archived from the original on 2016-10-03. ^ "2014 Florida Gators". Archived from the original on 2016-04-10. ^ a b University of Florida Athletic Association. "Florida Football 2018 Media Guide" (PDF): 125. Retrieved 26 March 2019. ^ Cite error: The named reference cfbdwfla-ala was invoked but never defined (see the help page). ^ College Football Data Warehouse, Florida vs. Arkansas. Retrieved March 11, 2012. ^ a b c College Football Data Warehouse, Florida vs. Auburn. Retrieved March 11, 2012. ^ a b c d e f College Football Data Warehouse, Florida vs Georgia Archived 2015-07-07 at the Wayback Machine. Retrieved March 11, 2012. ^ College Football Data Warehouse, Florida vs. Kentucky. Retrieved March 11, 2012. ^ Can the Wildcats stop being Gator bait? ^ a b c College Football Data Warehouse, Florida vs. Louisiana St. Retrieved March 11, 2012. ^ College Football Data Warehouse, Florida vs. Mississippi St Archived 2015-07-07 at the Wayback Machine. Retrieved March 11, 2012. ^ College Football Data Warehouse, Florida vs. Missouri. Retrieved March 11, 2012. ^ College Football Data Warehouse, Florida vs. Mississippi. Retrieved March 11, 2012. ^ College Football Data Warehouse, Florida vs. South Carolina. Retrieved March 11, 2012. ^ a b c College Football Data Warehouse, Florida vs. Tennessee. Retrieved March 11, 2012. ^ College Football Data Warehouse, Florida vs. Texas A&M. Retrieved March 11, 2012. ^ College Football Data Warehouse, Florida vs. Vanderbilt. Retrieved March 11, 2012. ^ "Georgia-Florida game needs a name and a trophy". ^ Says, Cline. "Party on: Florida, Georgia agree to keep rivalry game in Jacksonville through 2021 | OnlyGators.com". Retrieved 2016-06-03. ^ "Florida-Georgia tickets not going up". jacksonville.com. Retrieved 2016-06-03. ^ "UF-UGA: War for the 'Okefenokee Oar' | GatorCountry.com". GatorCountry.com. 2012-10-26. Retrieved 2016-06-03. ^ "Georgia vs. Florida - Game Summary - October 31, 2015 - ESPN". ESPN.com. Retrieved 2016-06-03. ^ "Dickey Replaces Graves As Florida Grid Coach". The Dispatch. January 1, 1970. ^ WOJCIECHOWSKI, GENE (1990-08-02). "Arkansas Joins SEC; There May Be More : Colleges: Miami, Texas, Florida State, South Carolina, Texas A&M also might wind up in Southeastern Conference". Los Angeles Times. ISSN 0458-3035. Retrieved 2016-06-03. ^ "Best season for all 14 teams since SEC split into divisions". Saturday Down South. 2016-02-12. Retrieved 2016-06-03. ^ "Steve Spurrier, Phillip Fulmer helped fuel fantastic Florida-Tennessee rivalry". 14 October 2015. ^ "Winsipedia - Florida Gators vs. Tennessee Volunteers football series history". Winsipedia. ^ "On this day in Florida history - May 15, 1947 - Florida State College for Women goes co-ed, renamed FSU". Florida History Network - Your one-stop source for celebrating and preserving Florida's past, today. Retrieved 2016-06-03. ^ "Florida State Football - 1955 Year In Review". www.nolefan.org. Retrieved 2016-06-03. ^ Norm Froscher, "Golden anniversary history lesson Archived 2014-07-15 at the Wayback Machine," The Gainesville Sun (November 28, 2008). Retrieved December 1, 2012. ^ "FSU-UF Rivalry". nolefan.org. Retrieved 2016-06-03. ^ "Gators-Seminoles rivalry has come long way". ^ "Winsipedia - Florida Gators vs. Florida State Seminoles football series history". Winsipedia. ^ "FSU-UF rivalry as good as it gets". ^ "1997 Game Recap / Allstate Sugar Bowl". ^ "Auburn-Florida State: Big win in Jordan-Hare propels Seminoles". ^ Christopher J. Walsh. Where Football Is King: A History of the SEC. p. 62. ^ "Auburn will have to wait until 2019 to play Florida as SEC sets 12-year schedule rotation". ^ a b c d College Football Data Warehouse, Florida vs. Miami. Retrieved March 11, 2012. ^ Hutchins, Andy. "Florida, Miami will kick off 2019 season in neutral-site game in Orlando". Alligator Army. Retrieved 13 March 2018. ^ Heisman.com, Heisman Winners, 1966 – 32nd Award: Steve Spurrier Archived October 4, 2013, at the Wayback Machine. Retrieved November 16, 2012. ^ Heisman.com, Heisman Winners, 1996 – 62nd Award: Danny Wuerffel Archived 2012-03-27 at the Wayback Machine. Retrieved November 16, 2012. ^ Heisman.com, Heisman Winners, 2007 – 73rd Award: Tim Tebow Archived 2011-11-08 at the Wayback Machine. Retrieved November 16, 2012. ^ a b "Maxwell Award Winners - College Football at Sports-Reference.com". Archived from the original on 2013-05-10. ^ "Walter Camp Player of the Year Award Winners - College Football at Sports-Reference.com". Archived from the original on 2013-05-10. ^ a b "Sammy Baugh Trophy Winners - College Football at Sports-Reference.com". Archived from the original on 2013-05-20. ^ a b "Davey O'Brien Award Winners - College Football at Sports-Reference.com". Archived from the original on 2013-06-05. ^ "Dave Rimington Trophy Winners - College Football at Sports-Reference.com". Archived from the original on 2013-06-16. ^ "Ray Guy Award Winners - College Football at Sports-Reference.com". Archived from the original on 2016-04-25. ^ "Jim Thorpe Award Winners - College Football at Sports-Reference.com". Archived from the original on 2016-08-12. ^ "Johnny Unitas Golden Arm Award Winners - College Football at Sports-Reference.com". Archived from the original on 2016-08-26. ^ a b "NCAA Football Awards (Chic Harley Award / Sporting News Player of the Year) - DraftHelp.com". ^ "Lou Groza Award Winners - College Football at Sports-Reference.com". Archived from the original on 2016-04-03. ^ "John Mackey Award Winners - College Football at Sports-Reference.com". Archived from the original on 2016-08-12. ^ a b c "The William V Campbell Trophy List". National Football Foundation. ^ Hines, Jesse (30 August 2012). "Tebow Time: Insights on Winning from Football's Rising Star". Penguin – via Google Books. ^ "Manning Award Winners - College Football at Sports-Reference.com". Archived from the original on 2016-04-05. ^ "Carlos Alvarez". College Football Hall of Fame. Football Foundation. Retrieved November 15, 2012. ^ "Charlie Bachman". College Football Hall of Fame. Football Foundation. Retrieved November 15, 2012. ^ a b "Doug Dickey". College Football Hall of Fame. Football Foundation. Retrieved November 15, 2012. ^ "Ray Graves". College Football Hall of Fame. Football Foundation. Retrieved November 15, 2012. ^ a b "Marcelino Huerta". College Football Hall of Fame. Football Foundation. Retrieved November 15, 2012. ^ "Wilber Marshall". College Football Hall of Fame. Football Foundation. Retrieved November 15, 2012. ^ "Emmitt Smith". College Football Hall of Fame. Football Foundation. Retrieved November 15, 2012. ^ a b "Steve Spurrier (coach)". College Football Hall of Fame. Football Foundation. Retrieved November 15, 2012. ^ "Dale Van Sickel". College Football Hall of Fame. Football Foundation. Retrieved November 15, 2012. ^ "NFF Proudly Announces Stellar 2013 College Football Hall of Fame Class," National Football Foundation (May 7, 2013). Retrieved May 7, 2013. ^ "Jack Youngblood". College Football Hall of Fame. Football Foundation. Retrieved November 15, 2012. ^ Pantages, Will (9 January 2017). "Steve Spurrier Re-enters College Football HOF". floridagators.com. University of Florida. ^ 2012 NCAA Football Records Book, Award Winners, National Collegiate Athletic Association, Indianapolis, Indiana, pp. 7–12, 14 (2012). Retrieved January 16, 2013. ^ Heisman.com, Winners 1966 – Steve Spurrier Archived October 4, 2013, at the Wayback Machine. Retrieved February 1, 2013. ^ a b c Hall of Valor, Forest Ferguson Archived 2012-05-19 at the Wayback Machine, Military Times. Retrieved August 23, 2009. ^ C, Bill (20 July 2012). "Mizzou Moves To The SEC: The Ol' Ball Coach And The Nouveau Riche". 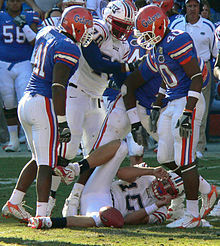 ^ "Wilber Marshall Named To UF's Ring Of Honor," GatorZone.com (August 15, 2007). Retrieved August 1, 2014. ^ "Ring of Honor at Ben Hill Griffin Stadium - Florida Gators". ^ "Writer Picks All-Time Gator Eleven, Going Back 10 Years To Name Taylor And Storter". The Evening Independent. October 14, 1927. p. 5A. ^ "Wuerffel, Marshall Highlight Gator All-Century Team". Lakeland Ledger. November 20, 1999. ^ "Gator Fans' All-Century Football Team Announced". ^ Sun, LEAH COCHRAN Special to The. "Retro Gators: The Gators will wear throwback jerseys when they take the field today". ^ "Flashback: 25 Years Ago, Gators Football Changed Forever". ^ "LOOK: Florida Gators wear all-orange uniforms for first time since 1989". ^ Poole, Brian (11 November 2015). "Story Behind the Gators' White Helmets". foxsports.com. ^ Lucas, Paul (10 October 2017). "Florida goes with 'swamp green' for new unis". ESPN.com. Retrieved 12 November 2017. ^ National Champs.net, The Helmet Project - SEC. Retrieved July 22, 2011. ^ UniformCritics.com, Photos of 2006 Florida Gators Throwback Uniform. Retrieved July 19, 2013. ^ UniformCritics.com, Photos of 2009 Florida Gators Nike Pro Combat Uniform. Retrieved July 19, 2013. ^ UniformCritics.com, Photos of 2009 Florida Gators White SEC Championship Uniform. Retrieved July 19, 2013. ^ "2018 Football Coaches". Florida Gators. Retrieved 2018-12-11. ^ FBSchedules.com, Florida Gators Football Schedules and Future Schedules. Retrieved June 7, 2018. Kabat, Ric A. (July 1991). "Before the Seminoles: Football at Florida State College, 1902–1904". Florida Historical Quarterly. 70 (1). JSTOR 30148092.